An estimated 32 million people in the U.S. are hearing impaired, affecting our ability to enjoy films, lectures and other pub­lic presentations or decipher public announcements at places such as airports and sports stadiums. While hearing aids improve a person’s ability to hear in quiet locations, they can’t filter out background noise and reverberation in public places. Find out how hearing loops are being embraced as a solution to the problem at www.newenglandhearingloop.com. Shanahan is pleased to be one of the few certified installers of hearing loops in New Eng­land. In this white paper, we will share information about hearing loops and answer some frequently asked questions about hearing loop installations. 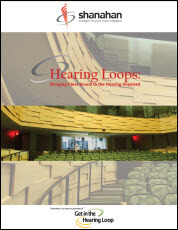 Fill out the form to the right to download your copy of “Hearing Loops: Bringing Clear Sound to the Hearing Impaired”.